Sand blasting is one of the parts of dry process used in garments washing. Sand blasting process is used for only in denim garments washing. 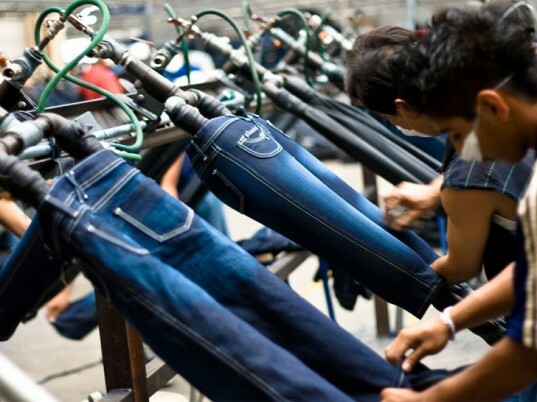 This process refers to a physical process which creates localize abrasion or color change on the denim similar to the effect seen on rough used jeans. Sand blasting is a mechanical process, where no need to use any chemical. Also it is a water free process. As a result no dying required for the garments. Any number of designs can be produced in the garments by using different techniques of sandblasting. At present, sand blasting process is now isolated due to creating health hazards. Another important cause is- buyers do not like the sand blasting effect due to covers the characteristics of fabric. Sandblasting process is done by using different kinds of sand blown to garments with air pressure to rub out the color. Hand sanding or hand brushing. Flat surfaces such as tables, ironing boards. Dummy such as inflatable dummies, sometimes standing, sometimes flat and sometimes seated. Sand blasting technique is based on blasting an abrasive material (Most of time sand) in granular, powdered or other form through a nozzle at very high speed and pressure onto specific areas of the garments surface to be treated to give the desired abraded look or used look. Varieties of abraded look or used look are possible in sand blasting’s technique. In this technique, a series of cylindrical rolls in a horizontal arrangement, either wrapped with an abrasive paper or chemically coated with an abrasive. In this technique, sand paper is used to abrade surface of the denim garments. Varieties of looks and designs can be produced by using hand sanding or hand brushing technique. Category: Garments Wash Tags: Method of Sand Blasting, Sand Blasting in garment wash, Sand Blasting Process, Sand blasting technique, Techniques of Sand Blasting, What is Sand Blasting? This article too much help full for us.. So i want stay with you for getting some more…..